Email Attachments allows you to automatically attach the documents as PDF Invoices, Credit memos, Shipments and attach your Terms and Conditions to the sale emails. Mageplaza Email Attachments extension is released to solve the problem about sending the email with billing documents in PDF format in Magento. With the help of this module, it helps admins to reduce time in managing the store as well as help your customers understand better about the products on your store. Now let’s experience this module!!! Enable: Select “Yes” to turn on this module or “No” to turn it off. 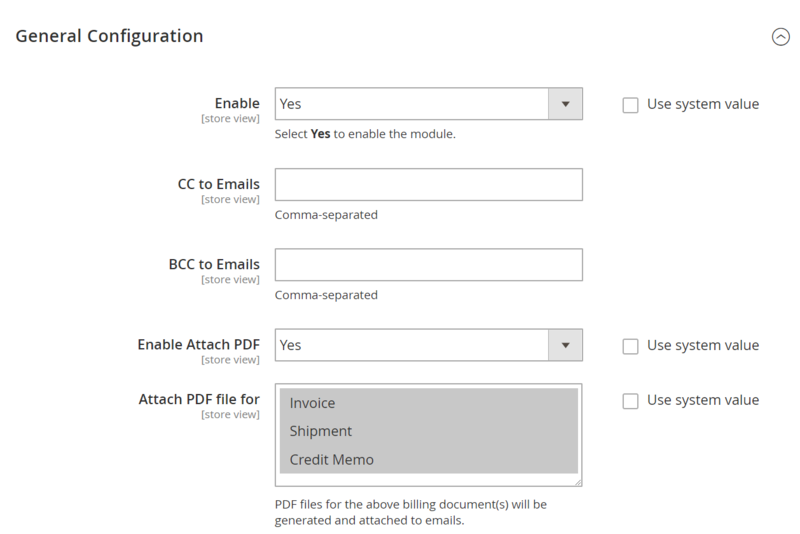 Enter the email address to send Attachments file copy to the customers you want to share. Allows importing multiple emails at the same time and all the recipients of the mail will see the list of emails of those who have received Attachments file copy. These emails are separated by commas. Allows importing multiple emails at the same time and all recipients of the message will not see the BCC recipient list. These emails are separated by commas. Click Choose file button to upload PDF file for Terms and Conditions. Allowed uploading the files: .pdf, .doc, .docx, .txt.